Digital Best Practices – Broad Street Co. In today’s world of digital media, the quest is no longer just about how many conversions one is looking for or how long a page view is. Digital marketers want to know about the process a consumer takes in their path to conversion in hopes of seeing how much each ad, whether it be display, search, social media, or more, contributed to a conversion. For marketers using attribution modeling, the easiest way was to attribute 100% of the sale to the last clicked ad. The problem with that, is people hardly convert after seeing one ad. So Which Attribution Model Should I Be Using? Excellent question! The truth is: it depends on goals and the business. For businesses looking to use the most up-to-date model but don’t have the time to create a custom model, then a Time Decay is most widely recommended. The theory behind Time Decay is that each touch point is considered and given weight in the overall conversion, but the amount that each touch point weighs increases the closer one gets to the direct channel. While not perfect, it allows all points to be considered in the conversion, and helps paint a better picture of what it took to make a conversion. This is important because in terms of a conversion funnel, the first clicked ad is seldom the last time a person will be exposed to a product or service on the web. If looking at a typical conversion which focuses on sales, the first click ad is only the beginning of the sales process. You have your first-click ad, which could be driving users to learn more on the website or on social media, then retargeting would be utilized to help reel your consumer back in. Additionally you need to be considering if an individual has been learning about your product from beyond their desktop, and ensure that mobile plays some type of part in their conversion. Now you may be asking yourself why this all matters, but the truth is that this attribution model (in fact any modern model) can be used to better understand how effective creative is, how strong your media mix is, and how relevant each touch point is to a conversion. The goal is to be constantly optimizing and figuring out what touch points are making sense vs, which ones aren’t, which will help save time and money in the long haul. However! Though Time Decay is a good choice, if your company has experience in attribution modeling and is willing to get more hands on with the attribution approach, a custom model makes the most sense. The truth about digital advertising is that the process one company has for a conversion is not going to be the same for another. You need to take into consideration that the number of touch points in a conversion funnel for your business will not be the same for another. Not only that, but you will also weigh different touch points differently depending on your goals and KPIs. For one client, the conversion may the most crucial point and so the last channel is important, but for a campaign focusing on brand awareness, maybe that first initial ad is actually the most important for beginning the consumer journey into learning about your brand. Taking these unique points into consideration will make your model a lot more specified to your business or client, and will help paint an overall more accurate depiction of what your consumers are doing from starting point to conversion. So shake off the shackles of Last-Click. The truth is that there is too much data today that is lost with Last-Click that can be utilized if a different model is used. Whether it is Time Decay, Custom, or the other types that exist (see Occam’s Razor by Avinash Kaushik), go explore and figure out which one is right for you or your client. Today Google announced the launch of its new service for ad agencies, Google Partners, through a livestream broadcast. The new service means a more streamlined model of certification, allowing clients and potential clients to find agencies like ours faster and to know that we’ve got the knowledge and experience to make their campaigns as successful as possible. During the livestream broadcast Google brought in experts to talk about why digital is at the heart of reaching your potential clients and how sales is evolving to a place of mutual collaboration between businesses and their potential customers. First, Mitch Joel, author of CTR, ALT, Delete spoke about the “one screen world.” As digital advertisers, we think a lot about cross-platform reach – getting the message out through television, PC web browsers, and mobile devices such as tablets and smart phones. But are people really looking at four or five screens at the same time? The answer is usually no; even though we use multiple screens in our lives we’re rarely moving back and forth between screens with the focus of a NORAD agent. Instead, we focus on one screen at a time – and increasingly this screen is the mobile device, with 1.3-1.7 billion people with access to mobile technology worldwide. Everything is digital. Everything is mobile. The question is this: how do we make a more affordable and practical business in a highly competitive media market? First, we have to keep focused on lean business models, making daily adjustments to our campaigns to optimize every click and impression. Also, we have to start thinking outside the box in terms of our content: using content as media, and creating utility over content. What is the consumer experience? How does the media add value to the consumer experience? Last, we have to start thinking about the greater context of our media. The consumer’s experience while on the go with their mobile device is going to be different than their experience on the couch surfing YouTube. It’s not just one big idea, it’s many big ideas. But those ideas are worthless if we can’t bring them to life, and to do that it’s essential to have great sales conversations. Whether it’s the client trying to sell the consumer on a new product, or the agency pitching a great digital strategy to the client, we’re all in the business of sales. This is intimidating for many people because they tend to associate the word “sales” with negative qualities, like pushiness or manipulation. 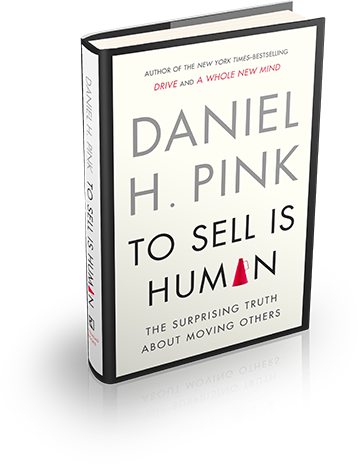 In the livestream, we learned from Dan Pink, author of To Sell is Human, that it doesn’t have to be this way. Selling is a collaborative conversation between two people, where the needs of the buyer can be met with the resources of the seller. In this case, both parties win, and with smart, targeted digital advertising campaigns we can achieve this goal by serving ad content to the right consumer at the right time and in the right place. But to do this we need to focus on two qualities. First, attunement, which is the ability to see things from the client’s point-of-view. When we pitch a client, we always like to start by repeating what we’ve heard is the most pressing goal of their company and their campaign. It’s our goal to make your goals our top priority. Next, we have to make sure that we provide clarity to our clients. Information is freely available to anyone, but making sense of that information is a key component of what we offer. We don’t just provide information, we curate it, and because of that we can devise and update our strategies in real time. We were thrilled to refresh ourselves with this great information, and we can’t wait to see what Google has in store with their new Partners portal! We don’t pretend to be UX experts, but we find ourselves frequently providing guidance to clients on building landing pages to optimize the results of their media campaigns. We have lots of conversations about getting users to click on an ad and do what we want them to do once they get to the landing page. More times that not, we can work on creative that pulls people to the destination URL only to be foiled by a clunky page design, confusing “ask” and sometimes a call-to-action that rests at the bottom a page well below the fold. For clients that may not have a budget to test multiple landing pages and different messages, we provide some basic information on building their landing page to get results. They seem simple, but we have given this advice many times and seen the client’s eyes get wide as if we’ve imparted the greatest bits of wisdom handed down from the mountaintop. You’d be surprised at how much information clients think is relevant for a simple “ask.” We tell clients to put the ask first and then do the explaining if they feel it’s necessary at all. Don’t overwhelm your prospect with too much information. Use images, but make sure they don’t push your content below the fold and make sure they are relevant to your creative, your subject matter and what you want your users to do. We remind clients to get the basic information they need first and to capture it in a database even if a form is not completed. If you really only need a name and email address, put that first and then follow it with all the other information you want. Deciding what you need and what you want in a request is a step that should drive the rest of the ask on the landing page. It’s worth asking your client to make sure they capture incomplete forms and don’t just purge that data. If someone enters their name and email address, you’ve got a warm lead to follow up with email campaigns. Just because they didn’t complete the form and click on “buy now” doesn’t mean they are not a warm lead. Also, don’t ask for too much information. We’ve worked with clients that have a complex enrollment process. We encouraged them to get the basic information they need and then follow up with detailed address, SSN and other fields once they had the basic information they needed to consider it a conversion. It’s both a time saver for the prospect and a way to increase conversions and reduce drop-offs in the process. The landing page is not a place to tout everything you have to offer. It’s to convert a user on one offer you’re promoting at that time. If you want users to enter a contest to win a trip, put an entry form on the page. Don’t also use this page as a way to get a user to sign up for email newsletters or go watch videos or explore your full site. By losing focus, you’re losing conversions. Make sure your formatting makes the page easy to follow and complete the action your want from the user. If you’re running a contest, enable social sharing tools so your users can spread your contest among their social sphere. Give your users something to enthusiastically share and then drive more users to enter. Even a retail landing page should give a user an option to share with their social sphere the purchase. In social media, people aspire to be like their friends so you create potential copycat purchases and lift through users considered “influencers” in social media. Now, these tips are the most basic we can give. There are many other resources for building landing pages that convert, but thinking through your media campaign from creative concept of the ad to the thank you page on the conversion is an important part of creating a successful campaign. We can help you on your next campaign by driving the conversation that drives conversions.